This metal cuff is the perfect showcase for my wired fish. 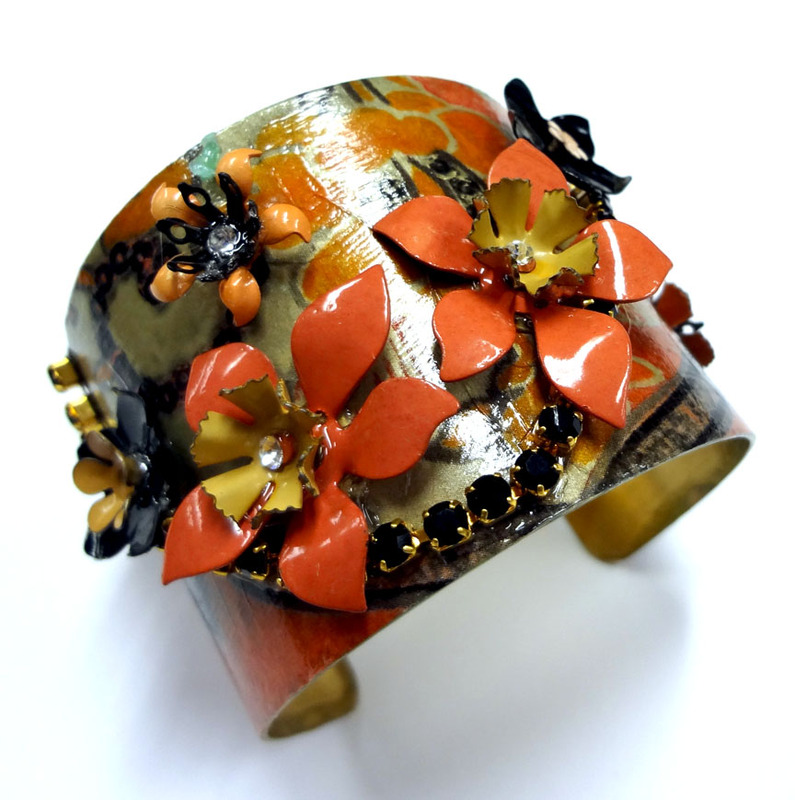 Nancy Donaldson used Dazzle-it aluminum wire and beads to create my featured piece. I knew I wanted to incorporate fish leather into a finished piece with wire and this was the ideal project. Choosing a fish leather colour was a challenge. There are so many options! I sewed my wire work to the fish leather. Then I just glued the fish leather to the brass cuff and trimmed away the extra leather. I always use Quick Grip glue for these projects. Here is a classic example of what you can do with our new Second Skin fish leather. This is one piece of fish leather. Each finished sample is one side of a tilapia fish. 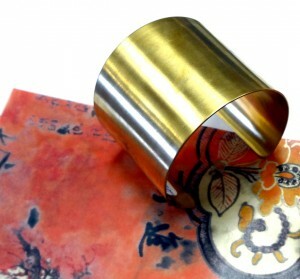 I glued my leather to a metal cuff using Quick Grip. I also used Quick Grip to attach my rhinestone chain. The chain I purchased in the John Bead Outlet. This is the first of many samples I’ll be posting using fish leather. Wait till you see what Fernando Dasilva made! Second Skin fish leather comes in ten colours. Glossy or suede finish. 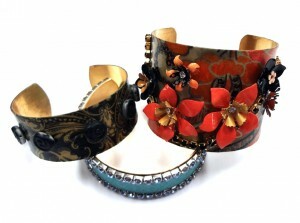 Here is a brass embellished cuff to inspire you to have some fun. 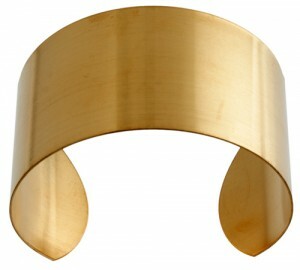 This is the type of a cuff I would definitely wear! The new brass cuffs at John Bead are quite elegant in their original state. But who could leave them unadorned? 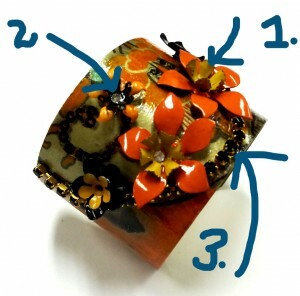 For this cuff I pulled out this tissue paper. 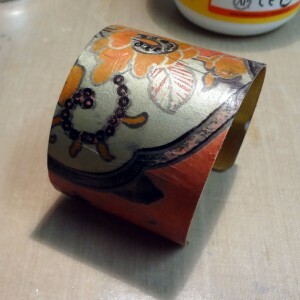 I mod podged the tissue to the cuff and lit it dry. 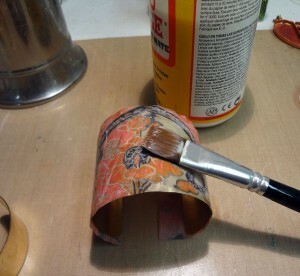 I also applied two layers of high gloss varnish to seal the paper. Then out came my favorite glue! I glued to the cuff metal flowers, crystals and rhinestone chain. No matter what I do with a blank cuff I end up with a fun, unique (and inexpensive) bracelet!